Foodista | Bourbon Liqueur? It's darned good stuff. I've found something that is so intriguing that I had to say something about it. Mystic is the name of this product and I have to share this with you. Unfortunately it's really in a very limited release, so I'd contact the manufacturer and ask them when it will be available where you live. If you are in the North/South Carolina area you are in luck and I recommend that you go out, right now and purchase a bottle. Why am I so enthusiastic about a liqueur? Because this one is unlike anything I've ever tasted. 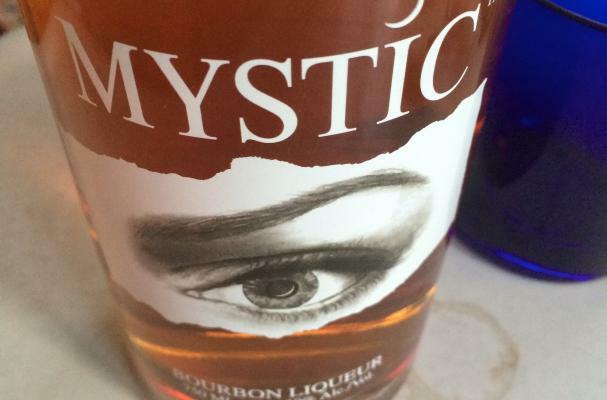 Mystic is indeed a mysterious pour. As Drambuie is to spiced and herb treated Scotch, Mystic is spiced and herb treated Bourbon. It is released at 30% Alc./vol. so it's not hard to drink. It's really hard NOT to like it. After spending some time on the phone with one of the owners of Barrister & Brewer (yes, one of the owners is a lawyer- and the other a brewer) I realized that great passion is behind this brand. As I mentioned earlier, Scotch whisky or rum (sometimes Canadian whiskey) is treated to a mixture of spices, roots and herbs. I've never seen anyone do a Bourbon liqueur that is so robust and friendly in the glass. It almost pained me to mix it! But I relented and made some lovely drinks with Mystic. The label reads hand crafted in small batches. The bottle is high quality glass with a stick on label that is also clear. The Mystic is a mysterious eye... The all seeing eye? Tasting Notes: Toasted nuts and brown butter give way to warm bread pudding and hard sauce over more bittersweet chocolate. There are baking spices tucked into the mix, not overpowering, nor overly wrought. This is as much at home in a snifter as in a cocktail. It would make a fabulous digestive. Ice is added to the glasses, not the punch!